Here we go again. It never surprises me, and yet it always hurts. Baltimoreans have been peacefully marching and protesting for over a week now. Yet, the bulk of mass media didn’t touch the story until the protests turned violent. What’s missing from the narrative they’ve been painting is HOW it became violent. I was at the protest. White Non protestors began throwing things at us and running their cars [through] us and calling us “n*ggers”. The media isn’t showing the patrons of Harbor, especially the drunk ones who were starting with us. 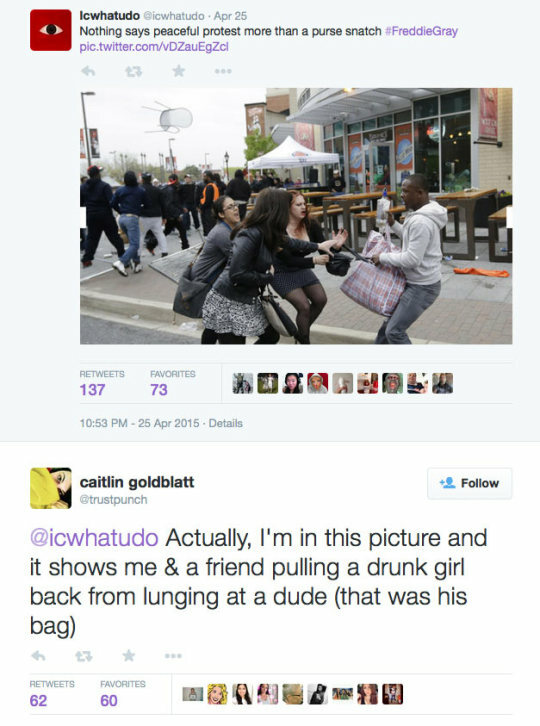 None of us were “acting out” or like “animals”, the 2015 code word for n*gger. There wasn’t any police presence the entire march. The police didn’t even block the streets so we could safely march. The passerby’s in the black neighborhoods used their cars and the men from [Nation of Islam] formed chains so we could safely pass. There weren’t any incidents as we marched through our areas. The people from the community cheered and thanked us as we passed. The problem started as soon we entered downtown. Ironically downtown was the beginning of the police’s presence. They (The Whites) didn’t want us downtown. Them already not wanting us there, their liquid courage combined with their blue courage showed their real feelings about us and all of their hate came out. The “animals” (as whites like to call us) weren’t the protestors; they were the racists who were driving [through] crowds that included women and children. Yes, the march became violent. When you have racist using their drinks and cars as weapons against people who were minding their business, you’re going to get violence. Those who looted weren’t even apart of the original protest. If this all seems like Déjà vu, that’s because it is: the very same thing happened in Ferguson after Michael Brown’s death, in New York after Eric Garners, and in every other city in America when an innocent life is slaughtered at the hands of a law enforcement officer, most of whom will walk away scot-free. The media would like you to believe that all of the protests are violent and that the black citizens of Baltimore are just going nuts. This couldn’t be further from the truth. One burning building will be looped on television over and over and over again. The thousands of demonstrators who did it the right way, I think, have been lost in the discussion. This is not new, and we shouldn’t pretend that it’s new. People fail to realize that the form of slavery that conservative history books would love to blot out was abolished in 1865, but slavery itself still exists: it’s called the modern prison system. With the 13th amendment came a loophole that allowed for forced labor to exist when used as punishment for a crime. In essence, slavery was just merged with law enforcement and re-branded. It’s no secret that African American and Hispanics comprised 58% of all prisoners in 2008, even though they only make up about 25% of the US population. The “War On Drugs” disproportionately locked up black and brown bodies at a ratio of 10:1 over their white counterparts, even though statistics show that whites use drugs at a ratio of 5:1 over African Americans. Racism and bigotry also didn’t just magically disappear with the ratification of the Civil Rights Act. It’s a sad fact that 50+ year old quotes from Dr. Martin Luther King and Malcolm X read as if they were written today. As much as we have progressed as a nation, the narrative portrayed hasn’t. 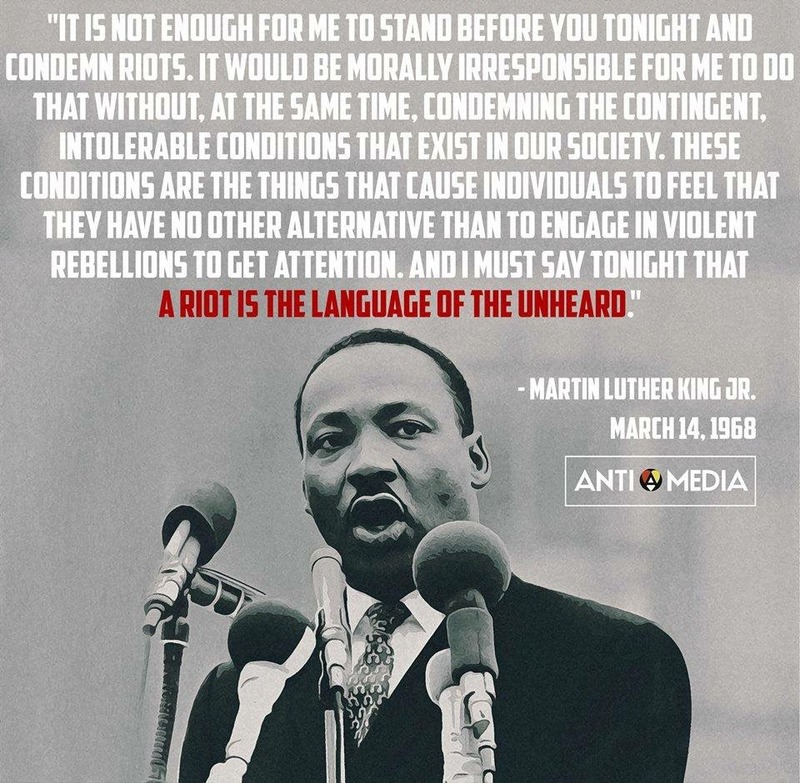 The media is one of the biggest agitators in #Baltimore. They want to focus on the riots without talking about the root. The media portrayal of black and brown lives is just a rook in the chess game that is Systemic Racism, and is (for the most part) so blatantly hypocritical, it’s nearly laughable. When the rioters are mostly white, they are portrayed as passionate fans. When they are mostly black (usually after the slaughter of an innocent life), they are thugs looking for destruction. 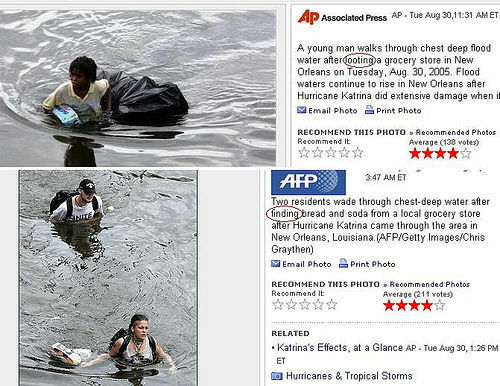 In the aftermath of Hurricane Katrina, whites were portrayed as “survivors searching for food” while blacks were “looters”. When James Holmes murdered 12 people in a crowded Colorado movie theater, he was just “troubled”. When Michael Brown was murdered by Darren Wilson for “ignoring police orders”, he was a “demon” deserving of death. One was a murderer, the other innocent. Yet, the latter gets vilified. Let’s look at the facts. Michael Brown: shot and killed because the cop wanted to assert his power and lost control of a situation he provoked. His killer walks free. Eric Garner: killed by chokehold for the same reason. His killer walks free. Rekia Boyd: shot in the back of the head by an off-duty officer with an unregistered gun. Her killer walks free. These are just ones we know about thanks to social media, since most mass media won’t even touch these stories with a ten foot pole. How many others have been slaughtered by law enforcement and their killers walk free because of their badge? Yes, I am aware that the cop that killed Walter Scott was charged with first degree murder. The ONLY DIFFERENCE is that Scott’s death was caught on tape and broadcast to the world. The others weren’t. As much as people would like to believe that we live in a post-racial society, the reality is that slavery still exists and mass media (alongside right-wing Americans) still believe that Blacks are 3/5s human. Bold statement, I know. That doesn’t mean it isn’t true. The proof is in the blood shed. Chris Hayes shows how the news talks about black people by talking about white people instead.